Suicide bombers have killed at least 34 people in a series of apparently co-ordinated attacks in central Baghdad. The attacks, which wounded at least 224, targeted the headquarters of the International Committee of the Red Cross and four police stations across the city on Monday. The attack marks the first time a suicide bomber has struck the famously neutral international aid agency in its 140-year history. The BBC's Jill McGivering in Baghdad says the relentless morning of attacks was unprecedented, even for post-war Baghdad. 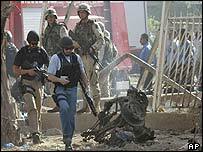 In one of the police station bombings, a US soldier was killed and six were wounded. The attacks began at 0830 local time (0530GMT), the last coming at 1015. The bomb which hit the Red Cross building appears to have been packed into an ambulance, which exploded as it entered the gates. The United Nations Secretary General, Kofi Annan, said the attack on the Red Cross was a crime against humanity. Iraq's interim Deputy Interior Minister, Ahmed Ibrahim, said eight policemen and 26 others had been killed in the day's bombings. It is not clear if the police figures include the suicide bombers themselves and the dead American soldier. Some reports put the death toll as high as 42, but that figure has not been confirmed. According to Iraqi and US officials, the would-be suicide attacker who attempted to bomb the fourth and last police station was stopped by police fire and captured. The would-be bomber told police he was Syrian and was found to be carrying a Syrian passport, said a US military spokesman, Brigadier General Mark Hertling. General Hertling suggested that Monday's attacks bore the hallmarks of "foreign fighters". His remark contrasts with a statement by a senior US commander in northern Iraq, Major General Raymond Odierno, who said that virtually all the fighters opposing his troops were Iraqis. "We have not seen a large influx of foreign fighters thus far," he said on Monday. General Hertling stressed that, although co-ordinated, the attacks - on the first day of the Muslim holy month of Ramadan - were "not synchronised" and "not very professional". The BBC's security correspondent Frank Gardner says intelligence experts believe al-Qaeda could have been involved in the bombings. Reacting to the latest Baghdad attacks, US President George W Bush said "these people will kill Iraqis, they don't care who they kill... and we will find them". He vowed that the US would "stay the course" and ensure the emergence of a free and stable Iraq. Twelve people died in the attack on the ICRC, a spokesman said, including two Iraqi security guards and several passers-by. Witnesses said the driver of the vehicle which exploded was among the dead. "I saw an ambulance car coming very fast towards the barrier and it exploded," said an ICRC guard quoted by Reuters. The blast wrecked a dozen cars in the area and blew down a 12-metre (40-foot) section of the building's front wall, while inside there was heavy damage, with shattered glass, doors blown out and collapsed ceilings. The ICRC expressed outrage at the bombing. A spokeswoman in Baghdad, Nada Doumani, said: "We only have a few foreigners here, as we rely on our Iraqi brethren. "This is a hideous act, a reprehensible act against the ICRC." "The deadliest day of violence since American troops took the city"